Guitar Hero TV show in the works? Does the idea of a Guitar Hero TV show rock your world? Activision looks likely to eke as much out of its 'Hero' franchise as possible, with discussions that its Guitar Hero franchise could be turned into a reality TV show. Now, we know what you are thinking, as we thought it too. Unless you have five pints of Snakebite and Black inside you, watching your friends strum away on fake plastic guitars to your favourite metal tunes is not the most fun, so watching the a show of it sounds rather tedious. But it seems that the show could be based around watching real people become real guitar heroes on real guitars, with a concert also being discussed. While you wait for the TV show, Activision is making sure that you aren't without your Hero fix by announcing the release of a number of games this year. These are Guitar Hero 5, DJ Hero and Band Hero. 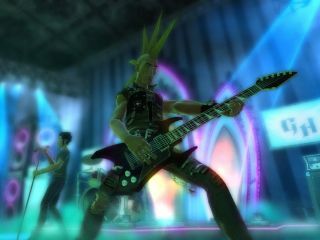 "Our Guitar Hero business up until now has been just classic rock," said Chief Executive Robert Kotick about the new games. "We're now broadening out the Guitar Hero fan base to every category of every listener and player." Rumours that 'Classical Hero' is in the works and will feature a plastic cello, wireless harp and 14-piece brass band are unfortunately unfounded.